For me Christmas always means baking bread and cookies, this year I couldn’t travel the world cuisine to make one traditional Christmas bread as time is running out now. So, for the time being I decided to stick with Christmas tree bread as my kiddos helped me making this bread. 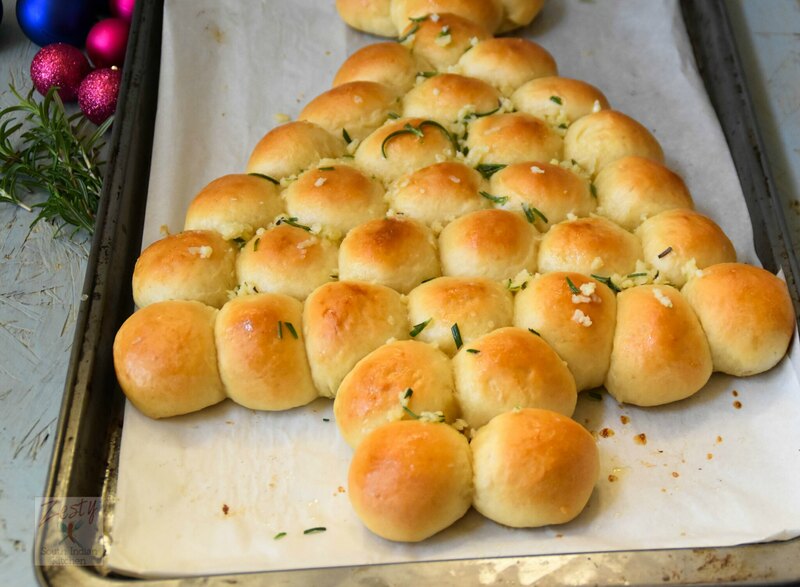 This is easy dinner rolls which can be show stopper on your Christmas party table. This is my most trusted recipe which I adapted from King Arthur flour website. I have made my turkey bread with this. 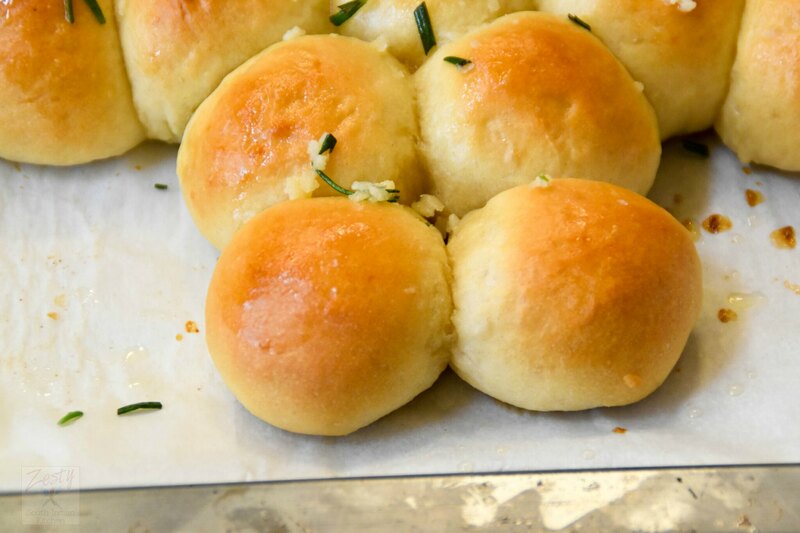 This is the Easy and soft dinner rolls that are also bite size. You can make this with store-bought pizza dough for which I can see the recipes everywhere. But trust me if you try this bread recipe you are not going to look at any other. Even though it looks fancy, no extra effort is needed. Only time-consuming part is the making the small balls with dough, that you need to do it precisely as it requires weighing 36 balls of 22 grams each. Once it comes out the oven I brushed with melted butter, parmesan, minced garlic and fresh rosemary. You can play with your favorites here. But make sure to added minced garlic and rosemary as they make it more festive. When I decided to make this Christmas tree, my daughter told me to add a star, and without it mama, Christmas tree will not look good. I too liked her idea, as my kids are the one decorating the Christmas tree at home. Now they started adding stockings, and Elf in the Shelf to make sure that they are in the good list so and get gifts from the Santa. Yesterday my 5-year-old son came and asked me “Mama why you didn’t ask any gifts from Santa? I told him. I have everything, and I don’t need anything now. He was not happy with that answer. He told me you can ask something from Santa he will bring to you. Finally, I told him Santa only brings present to kids not the adults. I don’t know he satisfied with my answer, he just left the kitchen. Coming back to recipe, give it try you will love it. This bread stays good at room temperature for 2-3 days. 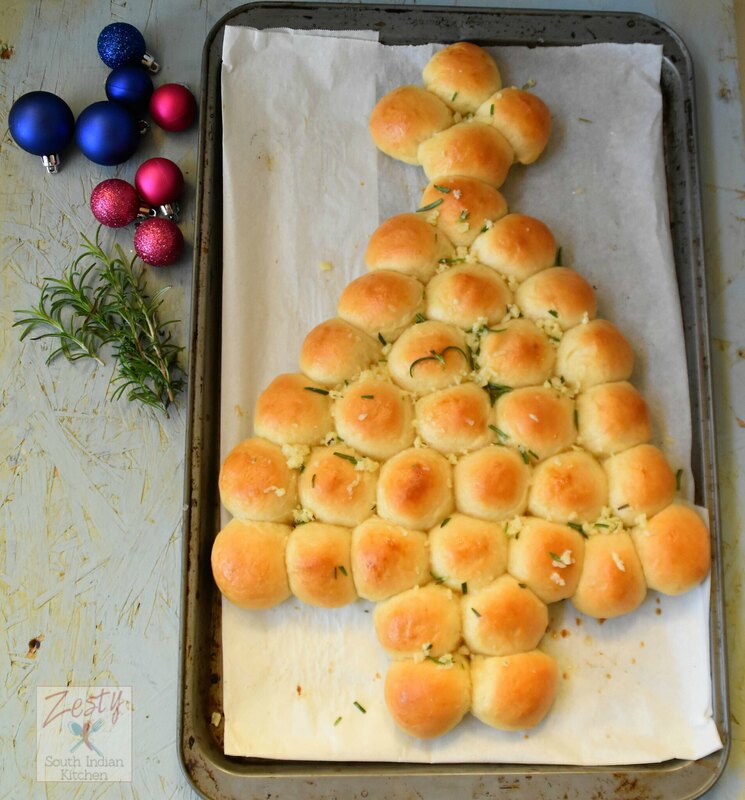 Delicious and easy show stopper Christmas tree bread for your Christmas dinner table. Combine all the dough ingredients in a bowl of kitchen aid stand mixer attached with dough hook, to make soft, smooth dough. Gently deflate the dough, and transfer it to a lightly dusted work surface with all purpose flour. Divide the dough into 22 g pieces makes about 36 dough pieces. For star you need 4 pieces of dough. For tree trunk also you need 4 pieces. Then rest of pieces arrange as tree, Staring from 1 in first row and increase one each stop at 7 dough balls. After an egg wash and bake them for 18 minutes, until they're golden brown on top and the edges of the center bun spring back lightly when you touch it. An instant-read thermometer inserted into the middle of the center bun should register at least 190°F. In a small bowl mix all the ingredients for rosemary garlic Parmesan butter and set aside. Once you remove the bread from the oven brush generously with For rosemary garlic Parmesan butter. After a couple of minutes, turn them out of the pan onto a cooling rack. Serve warm. Store leftovers well-wrapped, at room temperature. 10. Enjoy as much you want. *if you don’t have potato flour, use a mashed potato, then adjust amount of water accordingly. This recipe is adapted from my own turkey shaped dinner rolls. What a great presentation for the holiday dinner table. I know my guests would enjoy pulling this delicious tree apart. You are creative. Love both the tree and turkey bread. This is so creative. I have never seen a bread christmas tree haha looks amazing. And I love that the kids can help out as well. Great recipe. Wow – what a holiday show-stopper of a recipe. Thank you for sharing. What a creative way to make bread! It’s so cute and will get people talking at the table. Love this! Such a fun activity with kids!! Love this idea, so creative! Ah, I’m so far from home right now as I know my sisters and my mom would have loved to have this treat on Christmas day! Perhaps next year, along with the turkey bread! Oh man, this has me craving rolls! I’ve been wanting to try King Arthur Flour GF measure for measure flour, so I think I might have to give it a go here. These would be amazing with roast at holiday dinners. Great idea! My kids would love to pull this apart. I love how nice and golden they look. I bet they were good! I agree that their is quite nothing like fresh baked bread. 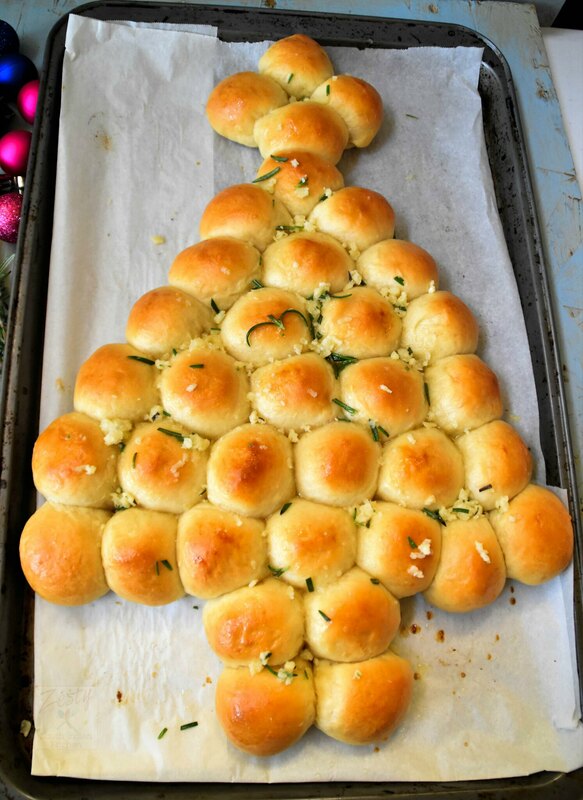 This Christmas tree design is so fun to make with the kids and garlic bread, ahhh say no more. This has to go on the Christmas dinner menu! This pull apart bread is so cute! I love the idea of making it into a christmas tree! This is so cute, i love that you take the time to make the bread. It is so much better than store bought, sadly mine never turns out quite like it is supposed to!